It is said that imitation is the highest form of flattery, though I normally scoff at such a notion. I mean, imitation generally indicates a lack of originality, or using other work as a crutch. 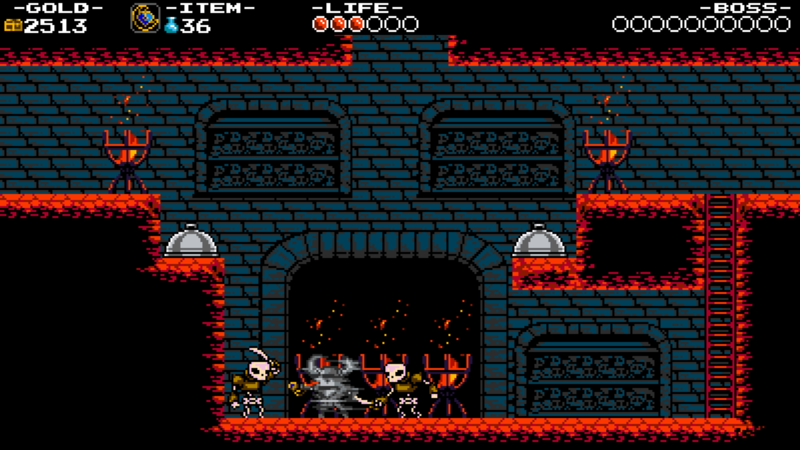 But believe me when I say that Shovel Knight imitates in the purest way possible. It pays homage to many retro classics while, inexplicably, somehow being its own game, and all the better for it! It has flavors of Mega Man, Castlevania, Zelda and even Mario, yet I would never say it is lesser for this. 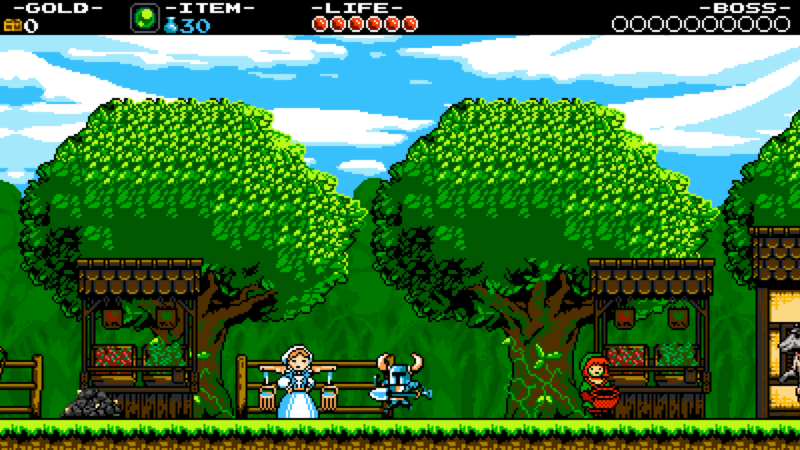 The true magic of Shovel Knight is how it honors these classics while somehow transcending them. 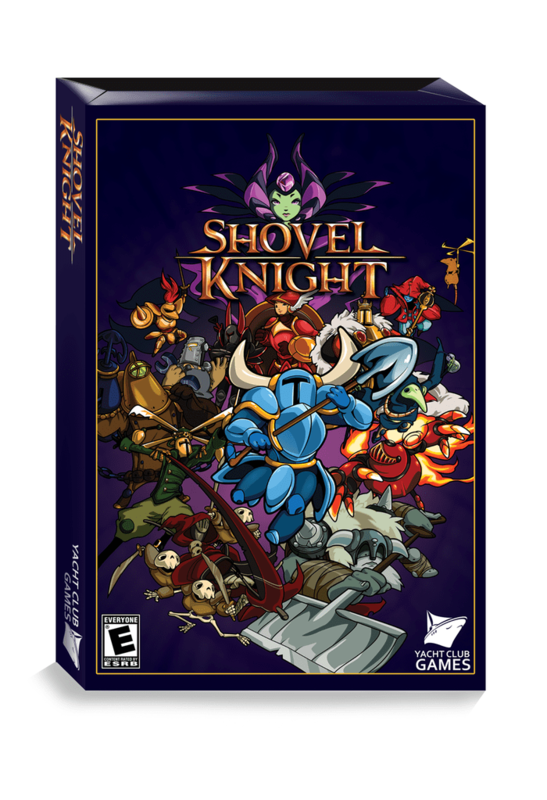 Some might say I am biased, and, while there is some truth to that since Shovel Knight represents my very first Kickstarter experience, I did my best to approach the game fairly, and with fresh eyes. With that in mind, I will set out to answer the question of how good Shovel Knight really is, and if it was worth the wait. Without any undue spoilers, I will say that Shovel Knight starts out with an introductory sequence that explains the basic plot. He is on a quest to save his beloved Shield Knight, and the Enchantress and Order of No Quarter are in his way, her eight magically empowered minions. That’s not to say that Shovel Knight himself is a raging maniac. Far from it. In the brief dialogue portions of the game, he is revealed to be a compassionate and honest, if sometimes thickheaded, hero. He merely wants to save his lady, and is determined to do so. Players explore a Super Mario 3-style world map, traveling from location to location. Occasionally, the route will be blocked by foes, either wandering mid-bosses or treasure rush mini-games, and you must constantly defeat one of the Order of No Quarter to unlock the path ahead. Though the path is relatively linear, it does branch out towards the middle of the game, and there are other side levels and areas littered across the map for you to explore. Oh, and levels are BIG. You’ll be making constant use of those checkpoints after you die. Along the way are a couple of hub areas, including the Village. This bustling area is full of things to do and people (including animal people) to talk to. Here, you can upgrade your stamina or magic meter, buy new Relics or trade in musical scrolls you find along your travels. This is but a small sample of all the things to do, but I will leave the others up to eager fans to discover for themselves. For a honest knight, he sure does like his gold. Gameplay is a shining example of retro done right. Shovel Knight himself has very interesting physics. He has a definite weight and solidity to his actions, yet is surprisingly nimble. A or Y allows him to swing his shovel, B jumps and, while jumping, holding Down lets him do his best Scrooge McDuck impression. 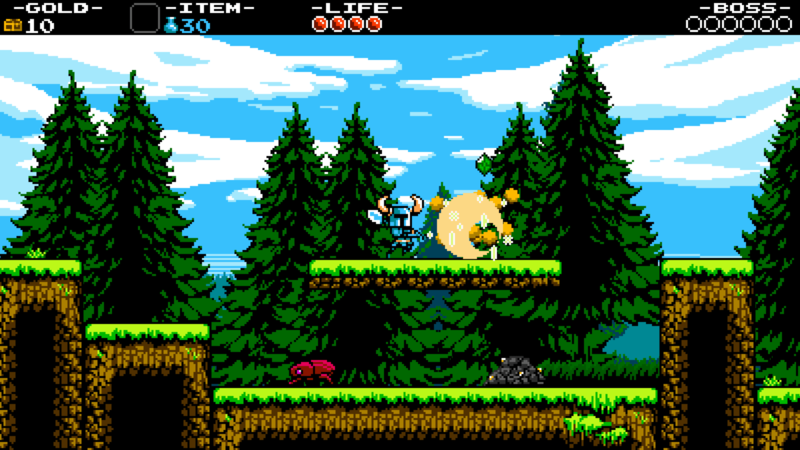 Unlike the famous fowl, Shovel Knight cannot bounce endlessly, and only does so on certain surfaces, including enemy heads and mounds of dirt. Note that you CANNOT safely bounce off of spikes, as I mistakenly tried early on. Spikes equal instant death, so avoiding them is paramount. Another key feature of the game is the use of Relics. These are like sub weapons from Castlevania, and you select them from the touch screen. Holding Up and attacking activates them, and there is a wide range at your disposal. The catch? You have to buy each and every one of them, either on the road or at the village, but, once you own them, you can use them at will until you run out of magic. 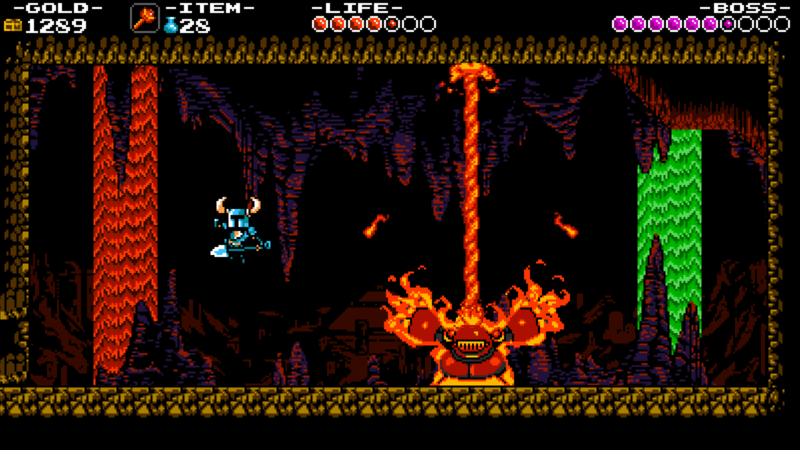 Some of my favorites were those that actively gave Shovel Knight new maneuverability, such as the Propeller Dagger that let him air dash or the Dust Knuckles that lets him punch through interconnected slabs of dirt to propel forward. There are many more beyond that, and I recommend you try out every one to find those that work best for you. Now you see him, now you don’t! The gameplay really shines in the game because it works like clockwork. Once you get the basics down, it’s all up to you. You will never find yourself dying because of unfair level design. Everything is beatable, but also quite challenging. This is especially true of the incredible bosses in the game. From the mid-bosses to the members of the Order itself, every fight in Shovel Knight is a knock-down drag-out affair. Even the simpler bosses, such as King Knight and Treasure Knight, have a veritable arsenal of attacks to use against you. They share some similarities to Mega Man’s Robot Masters, but, unlike them, they have no distinct weakness, so it’s up to you to survive and adapt to their patterns. And none of them are slow. Even the hefty Mole Knight will blur past you as he burrows into every surface available. Better yet, each and every boss is unique! I promise you none will give you any sense of déjà vu. They were a true highlight of my experience.